Before Vic Tibbets returned my Delta, he function-tested it with about 200 rounds of 10mm factory ammo I'd sent him with the gun. This included both FMJs and HPs. Vic did final sighting-in with Georgia Arms' 180gn Gold Dot HPs. 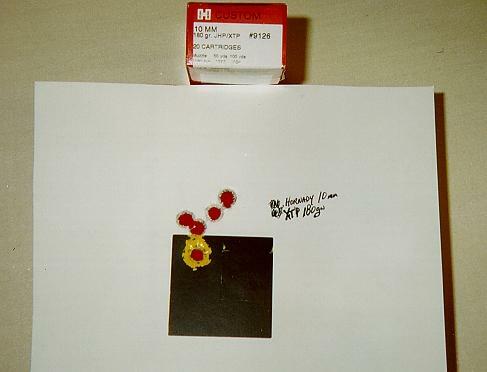 In a note, he indicated that it seemed to favor the Gold Dots as well as CorBon's 135gn HP load. As the pictures below indicate, the Delta did indeed like these loads. It also shot well with GA's 155gn GDHPs, Hornady's 180gn XTPs and Winchester's STHPs. 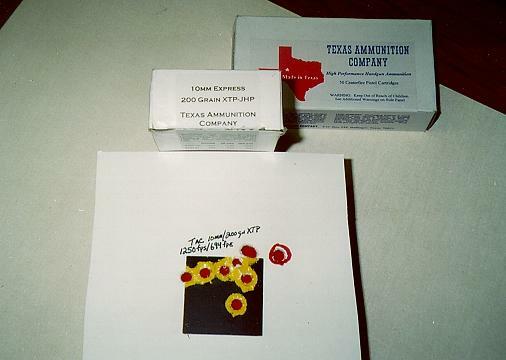 At the "full-power" end of the 10mm's energy range (or at least as hot as you're likely to see in factory 10mm these days), the Delta shot tightly with Texas Ammo's 200gn XTP load. It didn't care for PMC's 170gn JHPs. ERGONOMICS: For testing multiple 10mm loads, I installed a Wolff 24lb recoil spring and a buff with the FLGR. But it functions and shoots just fine with a 22lb variable spring, which I'll use most of the time. Comparing the Tibbets DE to the heft and feel of my personal S&W 1076, and a S&W 1006 borrowed from a friend, the Delta is noticeably lighter than either. While the Delta and the 1006 both have 5" slides, the Delta is slightly narrower across the top, the width there being 0.950 versus 1.11, respectively, according to my caliper. Carried IWB, it certainly feels flatter. In the hand the Delta points easily and balances well. Between the metal relief under the trigger guard, the high BT grip safety and all the checkering, recoil control is a nonissue. Cumulatively, this creates an elegant-handling 1911 that shoots comfortably despite the violent energy generated by this high-performance cartridge. A Delta Elite in stock form is cool enough, but when customized this finely it becomes the apotheosis of a 10mm pistol. SIGHTS & TRIGGER: The trigger is a Casull match-grade, long and solid, set at 4.5lbs crisp. There is no creep and very little take-up. While it certainly could have been set lighter, for CCW purposes this is as light as I prefer in a single-action gun. 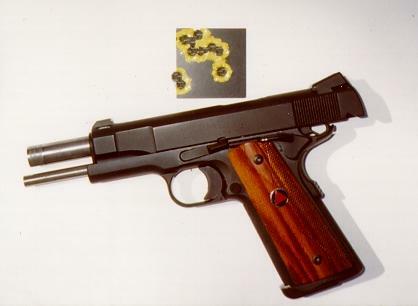 The rear sight is Novak's relatively new "Extreme Duty" (XD) adjustable unit for 1911 pistols. Mine has the tritium dots, and Vic mated the XD unit with a tritium dot front sight of optimum height. Novak also offers this sight in target black or with white dots. The XD rear sight is low profile, sturdy and snag-free. I'm not a big fan of adjustable sights, but this one combines the practical characteristics desired for CCW with the ability to adjust POA to POI, and dial-in your 10mm load of choice. In short, it brings versatility to the package, much like the 10mm cartridge itself. For windage, Novak's XD unit slides left and right in the dovetail, just like his fixed sight. The gun came back centered dead-on for most loads, but the initial "sighter" shots landed high. That was easily fixed by 3 or 4 downward clicks on the large elevation screw. ACCURACY: This Delta is inherently more accurate than I could ever hope to hold. Credit for the tight groups goes to Vic and his outstanding fitting of the Bar-Sto barrel and bushing. Two variables, however, might have produced smaller groups. The first is, obviously, a better shooter. The second is a lighter trigger. I'd ask Vic to set it up for a "duty/carry" weight of 4.5lbs, which he did. For anywhere but the range, that's as light as I personally feel comfortable with. However, as of this writing, the gun has digested about 500 rounds, and the trigger feels smoother. So it's possible I'd do better now. RELIABILITY: With the exception of two bobbles, the Delta ran flawlessly with a variety of 10mm ammo. 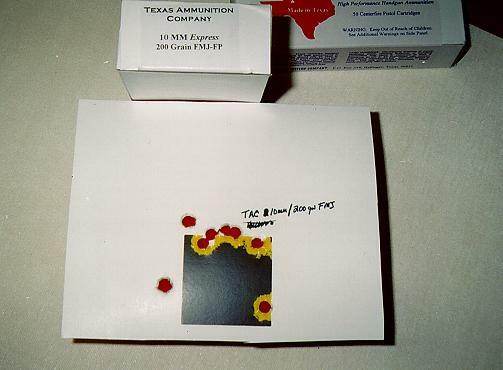 The magazines used for testing consisted of several 9-rd CMCs and a few 8-rd Colt mags. The bobbles involved two failures to eject (FTEs), which I don't feel were the gun's fault. These FTEs occurred while using the same CMC mag to shoot GA's 180gn FMJ "practice" ammo. 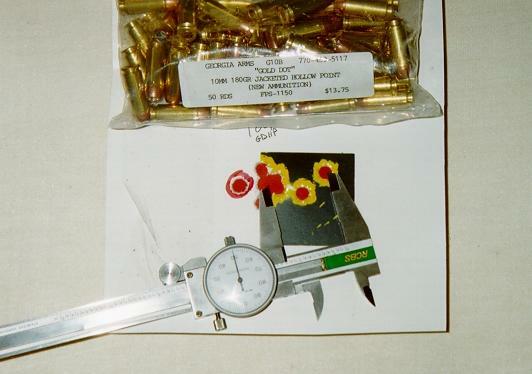 This is "remanufactured" ammo using previously fired brass. Possibly out-of-spec brass may have caused the FTEs, but the 180gn FMJ stuff shot fine in other mags during sighting-in. I marked the suspect mag, laid it aside, and went on. No other problems occurred. Magazines locked into place securely, and all rounds fed smoothly. There were no failures to feed. 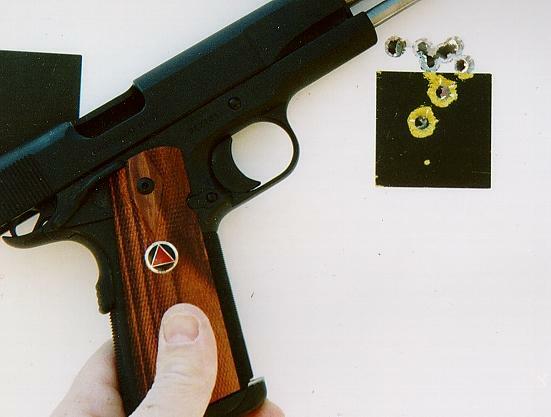 The Ed Brown tactical mag button, a slightly extended unit, permitted positive ejection of the magazines without grip-shifting. And except for the two FTEs noted, brass was ejected vigorously. Many thanks again to fellow 10mm fan, NordicG3K, for his technical assistance. The Tibbets Delta Elite is range ready. 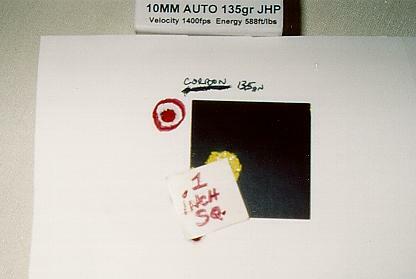 Ammo shown is Georgia Arms 10mm/155gn Gold Dot HPs. 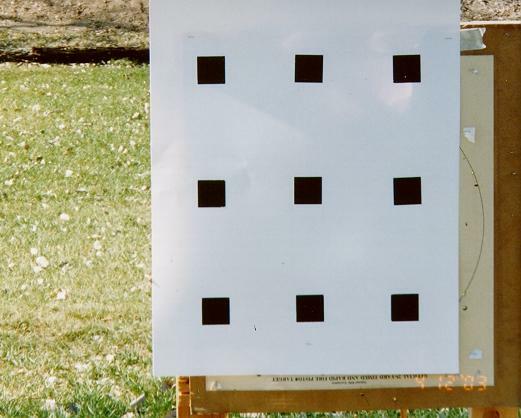 Targets were 2" black "Shoot-N-Cs" on white cardboard. Shooting was done off-hand from 20 yards (60ft). 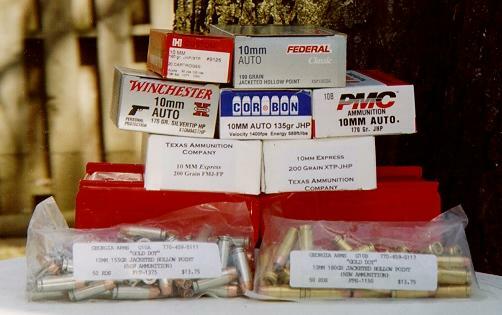 10mm ammo used: (top) Hornady 180gn "full-load" & Federal 190gn "X" load; (2nd row) Winchester 175gn, CorBon 135gn & PMC 170gn; (3rd row) TAC 200gn XTPs & 200gn FMJs; (bottom) GA 155gn GDHPs & 180gn GDHPs. 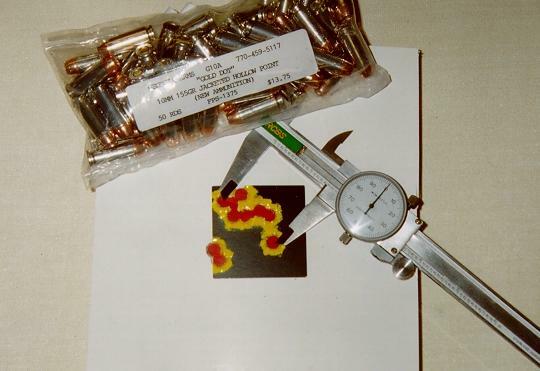 Caliper measures 1.4" for 9-shots of 155gn Gold Dots. 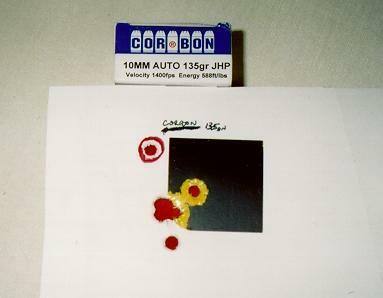 6 shots of CorBon 10mm/135gn HPs are covered by 1 inch square. PMC 170gn HPs. This 8-shot group opened up to 2.5". GA 180gn GDHPs. Excluding the circled flyer in this 8-shot group, remaining 7 shots went into 1.25". Flyer increases the group to 1.75". Who says "heavy & fast" can't be accurate? 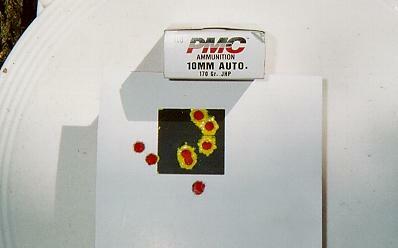 9-shot group is TAC 200gn load using Hornady XTP-HPs @ 1250fps. With the flyer, it measures 2.5". But 8-shots went into 1.7". TAC 200gn FMJ-FP @ 1250fps. This 8-shot group opened up to 2.5". At this velocity the DE prefered the XTPs. Hornady's own "full-power" 180gn XTPs @ 1180fps. This 5-shot group measures 1.5". 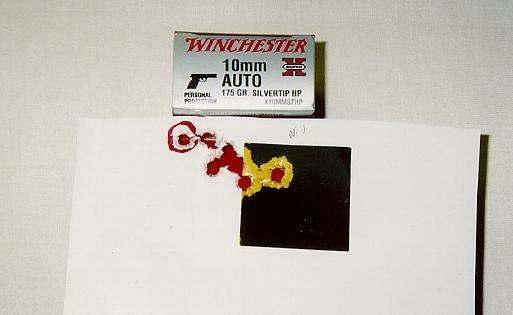 8 shots of Winchester 175gn STHPs. Excluding the circled flyer, 7 shots went into 1.75". 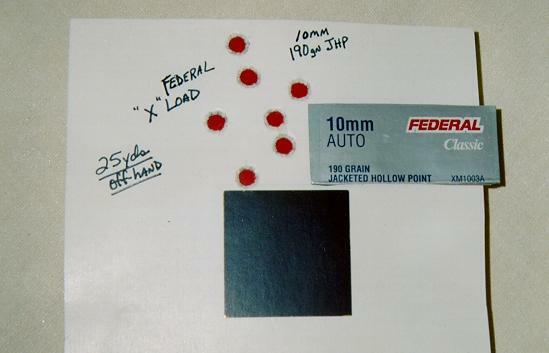 Federal's 190gn "X" load produced this 8-shot group. It measures 1.75", with the upper 6-shot cluster going into .90". 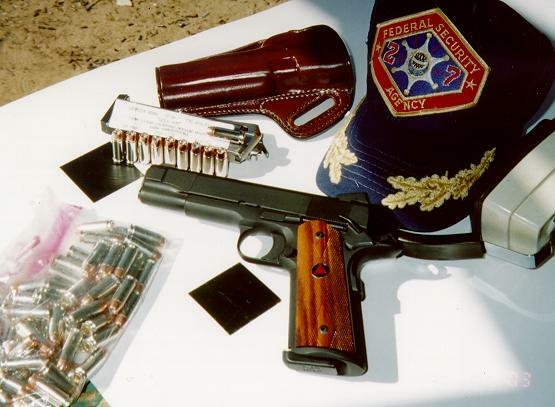 Topped with "felon-stopper" HPs, Federal's "X" load (#XM1003A) was used by the FBI in its S&W 1076s. Good enough for government work? Firing from 25yds off-hand, 7 shots of Federal's 190gn "X" load produced this stringy 2.5" group.